No. Don't worry, my comic book friends. 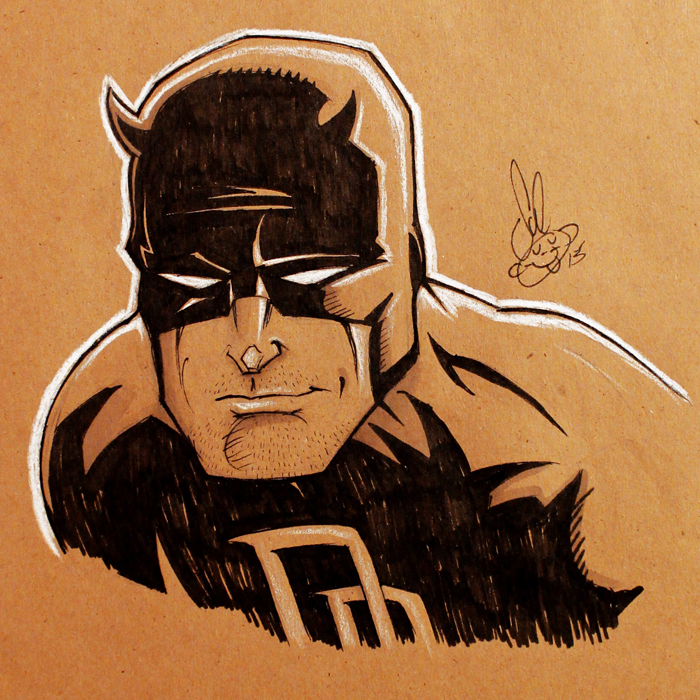 Matt Murdock isn't dead. 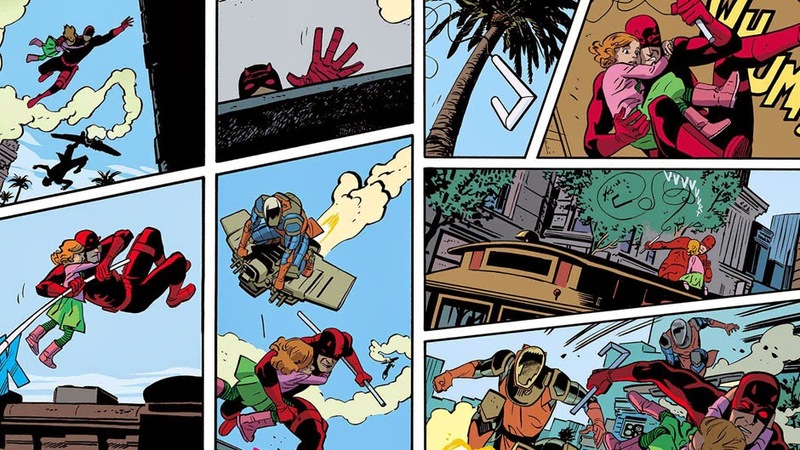 He's just having a subtle break until Mark Waid, Chris Samnee, plus Paolo Rivera, get off their collective backsides and decide to create another adventure for him. It was eventually Published by Marvel Comics in April, 2014. The future's bright. The future smells of pineapple. To QUOTE Elayne Boosler: 'San Francisco is really fun and liberal, and it's my kind of politics. It's like being Jewish in front of Jewish people'. Now I'm sure that your stay here will be a rather different experience than your time in New York City. For instance, it's a lot brighter. The layout is more expansive. Plus the type of criminal that populate our state are very... errrr... how can I put this? No. Not 'garish'. That's more or less the same. But I suppose I could use the term 'devious'. You know. Like what happened a couple of day's ago, when those kidnappers' kidnapped my daughter and I asked you to track them down for me. You do remember this, don't you Matt. Because you were very good you know. Quickly figuring out where they were hiding her, before traipsing across town and snatching her out of harms way, despite being attached to a bomb. Anyway. I thought I just send you a quick message just to say, Hi. Please send my regards to your new partner... errr... hmmm... what's the name again? Wow! What a great new start to a great new ongoing series. Honestly, folks. Despite keeping the same creative team, in a very supple fashion this book is looking to be a more dynamic book than ever before. Of course this is largely due to Mark, Chris, and Paolo, working so well together. Because once again they've made one hell of a cracking read I can't seem to find fault with at all. As per usual Paolo's and Chris's artwork has that very vibrant style to it that I just adore following. And I especially liked the way they've made San Francisco seem more expansive in the background, highlighted with the neon and the clean looking hues. I suppose the only slight problem I had with this tale was the way that it ended. Now without giving too much away, when I saw the final page depicting somebody Matt thinks is dead but isn't, in an instant my stomach did a turn and I said to myself, 'Oh no! Not another one of those scenarios. Haven't they been through enough already?'. Because this is Matt's first(ish) adventure set in San Francisco, I thought it fairly appropriate if I musically paired it up with the Scott McKenzie hippy-classic of the same name. Groovy! For those of you who've never heard of a Kinder Surprise Egg, let me just say it's a smaller yet unconventional chocolate Easter egg, but with a more dynamic looking DIY-toy-hidden inside it. You got that, folks? Good. Cause this is what I'm going to compare to this comic book, all because of that scene where Matt figured out what was hidden inside the little girl he was trying to save. Hint-Hint! Prior to sitting down and writing this review, I promised myself that this time what I'll write will be worthy enough for you to read. 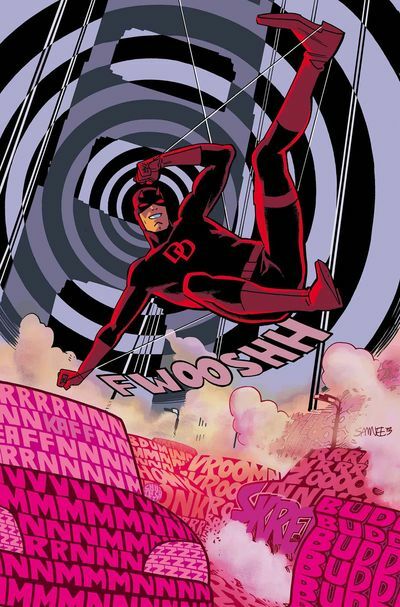 Well, as some of you already know by reading my previous Daredevil reviews, by in large I find it rather difficult to praise this series because it's so good to begin with. Honestly. There have been times in the past that I've looked at my computer screen and wondered what I should do. 'Should I insert a video clip instead of writing a conclusion?' I'd say to myself. 'Or what about if I try to compare this comic to some sort of vegetable?' I continue. Anyway, more or less I found a way not to sum up my conclusions but rather satirize them. Now don't you go worrying yourselves, my friends! I'm not doing the same sort of thing here and now. This piece of prose is a way for me to just say to you, 'Don't Worry. I promise you I'm going to get better at this', OK? Fingers crossed. This issue was f*cking amazing. Nuff said.